What is Marketing Automation and How Does it Affect Social Media? When we talk about automation in the world of social media, we often think it’s a bad word. And yet, when it’s done well, it’s actually an essential part of social media marketing. One-to-one communication is not possible with a large audience, so you have to find ways of keeping communication channels open with all of your audience and then, over time, identify the real prospects. This is where marketing automation comes into play. So, let’s take a deeper look about what marketing automation is and why I consider that marketing automation tools are in the social media tool category space! What is a Marketing Automation Tool? It’s a broad term, so it could include any tool that provides any level of automation in the marketing space. But, typically, you are talking about relatively expensive tools that provide a broad range of functionality that help to automate your marketing process. What Type of Functionality is Typically Provided? Email marketing is often central to what a marketing automation tool provides. They offer the capability to embed forms onto your website so that you can collect any email addresses that are entered, directly into their database. You can then communicate with your email subscribers through email newsletters/messages etc. and also through automated sequences. This is a core module and is probably the most important within a marketing automation tool, because this is where the automation happens. Within this tool, you can set up a series of actions that happen as a result of another action so that, if one thing happens, it triggers an action elsewhere. You can create contact records and build those contact records over time, based on the users’ activity. It’s all about keeping communication channels open, building the relationship and nurturing a person to a sale. For example, imagine if you knew that 10% of the people who attended a webinar would buy your products or services. You would then need to work out an automated sequence to get people into your webinar. If they click on the guide, you send them an invite to a webinar as they have shown interest. If they don’t click on the guide, you send them an automated email two days later to remind them to click on it. You know that when they read the guide, they will be more impressed with you and your company, so are more likely to do business with you. Behind the scenes, you are creating a contact record. You start off with an email address. When someone gets the guide, you add this to the contact record. When they click on the guide, this is noted. When they sign up to the webinar, you collect some additional information about them and then you use that for targeting in the future. After the webinar, you automatically send the people who didn’t attend a message about another webinar they can go to. You automatically assign people who attended the webinar to a sales person who tries to close the sale. Now you can see where the automation kicks in. The majority of tools have some type of visual interface that allows you to create these automated sequences, because they can become quite complicated. But can you see the benefit? Here’s an example of a basic sequence in Infusionsoft. The sequence is kicked off when there’s an email sign up. The user’s details are registered in the database and an initial email is sent. Then, three days later a follow-up email is generated. Most tools provide lead scoring capabilities, so you can assign a higher score to a lead as they progress through the sales funnel. This provides an easier way to identify leads with real potential. Attend a webinar = 30 points. As you want to capture as many leads as possible, the tool providers often include facilities for creating custom landing pages for your site, that you can use to get people to sign up for webinars, product launches, email subscriptions etc. 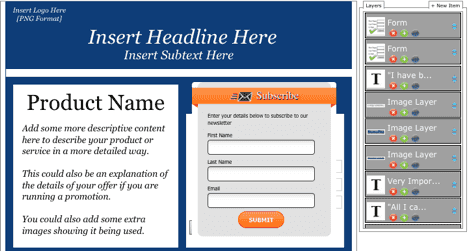 With this software, you can easily create custom pages to add to your site that will help with your conversion rates. Here is an example of the landing page creation tool provided by Ontraport. Your CRM (Customer Relationship Management) database is where all the details of the people/companies you are interacting with are stored. Marketing automation tools may have a basic CRM database, with integration available to some third-party CRM providers (e.g. Salesforce), or it might include more advanced CRM functionality built in. As a lot of interaction with your current and potential customers happens through social media channels, it’s really important that this is part of your marketing automation tool. You can monitor, kick start and record conversations. We will talk more about social media integration shortly. Consider your marketing automation to be a beast that needs feeding. You can feed it with new people, and one way of doing this is to create content that attracts people to your site. For example, HubSpot have a facility for creating blog content, and this helps feed the beast. There is typically some analytics integration within marketing automation tools so that you can track which of your existing subscribers visit your website. You can even include this within some automation. For example, if someone from a particular IP address visits the ‘buy now’ page on our website, we could send them an email with a discount to our product three days later if they don’t make a purchase. Different tools will also have more general analytics so you can see your pipeline, the status of your lead nurturing, sales generated etc. The degree of e-commerce functionality can vary from just being enough to integrate with payment gateways (e.g. Paypal and Stripe), or it could be more advanced and integrate with shopping cart facilities. If you have large, complex e-commerce requirements it’s unlikely that any marketing automation tool will have all the functionality you need, so you’ll have to consider a third-party tool. 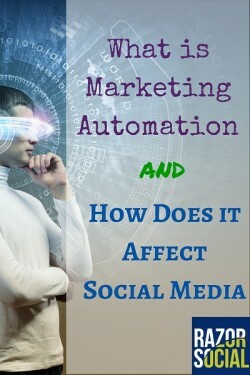 How does marketing automation affect social media? The initial conversation with your potential customer can happen anywhere and doesn’t have to kick off with an email. For example, when someone mentions your brand in a tweet, you can look up your contact database and see if you have got them listed. If you have, maybe you want to record that they have tweeted. This can be done automatically. Do you want to automate any messages through social media? It may seem like a bad idea but, if handled correctly, it can work. For example, Insight Pool allows you to build up automation around social media. You can target specific Twitter followers and send them a personalised message based on their previous tweets, perhaps something like, “Hey John, as an existing customer I thought you’d like to know about our 25% discount offer”. Of course, you can’t send out 1,000 of these messages in one day, but how about selecting the most relevant and targeted people and delivering this to a small list? So, social media is an important part of marketing automation and, increasingly, you will see marketing automation vendors integrating more with social channels. You can already see that some of them are starting to provide social media management capabilities, so we can expect to see more of this. What are the tools in this area? There is a wide variety of tools to consider in this area and maybe this is a topic for another post! There are many more, it’s a fast growing space! The full report (paid report) is on Venturebeat. Marketing automation is a very important area of business, and the vendors of these tools will start doing more work around the area of social media integration and automation. Because so much of the conversation is happening over social media channels, it’s a key aspect of marketing automation. Have you got any plans or experience with marketing automation tools? I’d love to hear your feedback.